AFP - A cycle path linking London and Paris will be completed by 2012, French and British local authorities said here on Friday as they formally launched the "Avenue Verte" (Green Avenue) project. "We want to symbolically link the Tower of London to the Eiffel Tower with an alternative mode of transport to the car that crosses landscapes of great quality," said Didier Marie, head of France's Seine-Maritime department. The 350-kilometre (218-mile) "Avenue Verte" will use existing national cycle network routes in southern England, passing through the counties of Surrey and Sussex. Cyclists will need to take a ferry across the Channel from Newhaven to Dieppe. 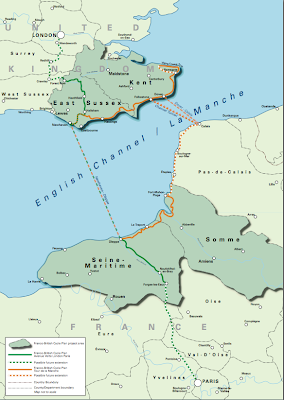 In France, the cycle path will follow a route through Normandy as it winds its way south to Paris. The route will incorporate stretches of disused railway lines as well as using regular roads where cycles will have their own dedicated lanes. "These (existing dedicated cycle paths) were built for tourism but we quickly noticed they were being used by people going to work," said Matthew Lock, a local councillor from the English county of East Sussex.